When you take the time to write a letter by hand, it’s clear you’re not just communicating a message. You’re creating something that’s intentionally more artful and personal. And you don’t want your sincere gestures undermined by having your writing interfered with, or adulterated by ink small mistakes. But when you’re writing against a natural grain surface, like an oak desk, you’re going to end up with small variations in your penmanship as your pen fights its way across the surface of the wood. Within the grain of the wood, even something as mild as uneven texturing can interfere with your page. If you’ve ever been writing on a surface that just didn’t feel right, then you know what a desk pad brings to the table. Anyone who’s written on a hard surface with a fountain pen will be familiar with the disastrous results. And even the most handsome wooden furniture won’t be comfortable to press your hand against for hours on end while writing. As you’re writing by hand, you want the surface you’re writing against to have just the right amount of resistance against your pen. Using your typical coffee table or desk, you’ll end up with small imperfections in the craft that detail-oriented people just can’t ignore. The surface you’re writing against shouldn’t be as firm as a piece of finished wood, but it also can’t be so soft that you end up pushing your pen through the page. And that precise firmness is exemplified by the natural feel of leather. Adding aesthetically both to your desk and the pages that come across it, desk pads are the kind of detail that can either make your life a little tougher, or a little easier. Correctly chosen, leather desk pads can offer a mix of functional elegance and aesthetic bliss. From your documents to your computer peripherals, you can have a smooth and functional workspace to rest your hands. Little can detract from the dignity of expensive computers, fine wooden desks, and the aesthetic of a modern office as much as gaudy cheap plastic. 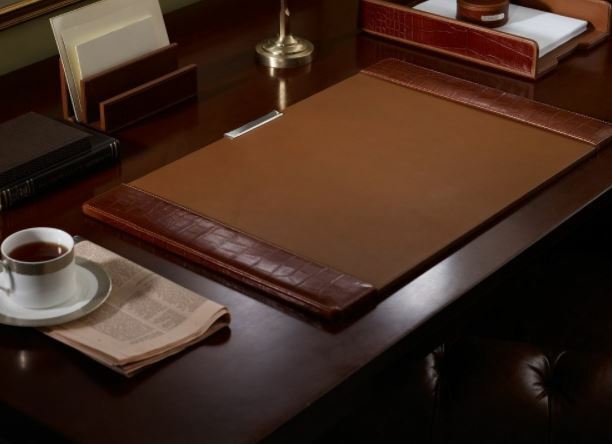 Leather desk pads convey a sense of dignity to anyone who enters your office. They’re a message you send to the world about the kind of organization you are part of and what your values are. If you don’t care about feel or image, you can probably do your writing on the back of reclaimed cardboard. But if you care about the appearance and feel of an object you’re going to see and use virtually every day, then you want the unparalleled quality of leather. In terms of features to look out for, many leather pads will offer side rails. With a side rail you can stick in business cards, calendars, notepads, or other documents you want securely placed on your desk. The precise design and implementation of that sidebar is worth paying attention to, for information like how deep the pockets are, or how much they affect the rest of the pads available space. Desk pads were created partially to provide a smooth and flat surface to write on, and partially to protect your valuable furniture from ink soaking into the desk. Though desk pads have become less common as more people are switching to digital communication, for those who write letters, desk pads are more essential than ever. Whether or not you’ve got an expensive desk, you’ll want to protect it from heat damage form laptops, scratches from regular use, and various stains. Desk pads can protect your furniture while facilitating a flat and comfortable writing surface, which ultimately reduces writing fatigue. When picking a desk pad, you’ll want to pay attention to the size of the pad. You can find smaller pads around 12″ x 17″ and giant pads as large as 35″ x 71″. The workable area of the pad is also altered by the addition of sidebars that may be used, so keep that in mind when thinking about how your pad will fit with all the relevant possessions placed on it. Another detail to consider is the backing of the pad, and the color of the leather. Essentially all pads will come with some type of gentle sticking surface to ensure it doesn’t slide around. 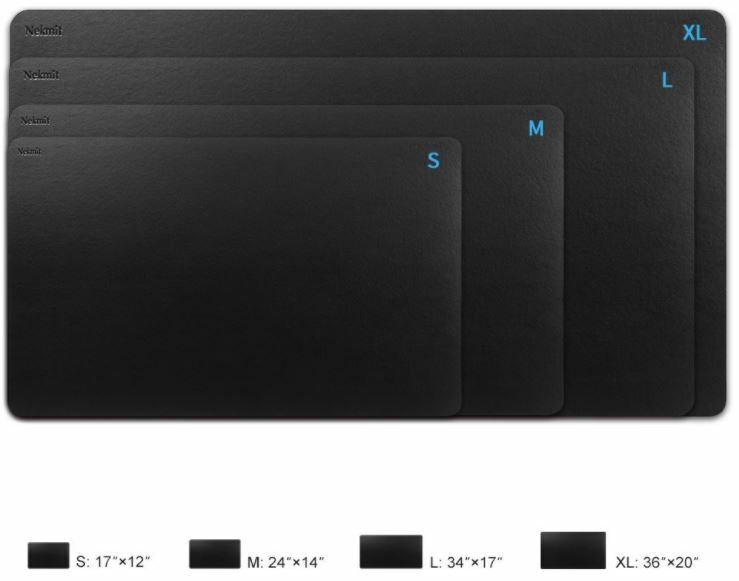 In terms of aesthetic, you’ll probably want a pad to match your desk, computer, or office. For leather pads that mostly means you’ll be picking between shades of black and brown. For desk pads, there’s no beating the optimum mix of comfort, durability, and the distinguished look of leather. 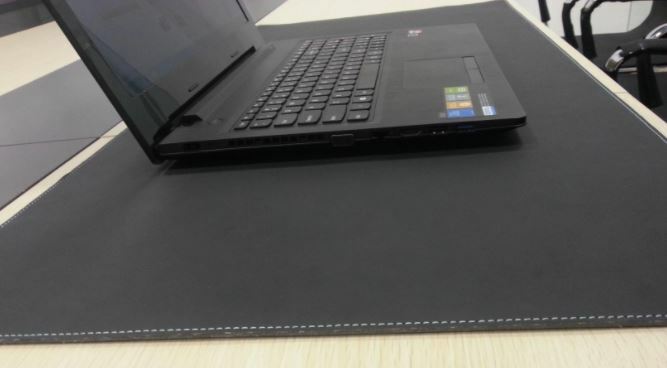 Unlike many cheap desk pads, leather pads aren’t at risk of producing glare that can distract you from work, they don’t look like cheap plastic junk, and everyone knows about the durability of leather. But there’s considerable range in terms of the quality of leather available to desk pads. Some leather is cheap and some comes from quality raw hides. If the leather doesn’t originate from a high quality hide, it has to be sanded to remove imperfections The result is a thinner and less durable product. Most high quality leather products are made of top-grain leather, and full-grain leather is a step above even that high standard. Nevertheless, even well-developed faux leather, made from space-age polyurethane surfaces and reinforced pollex, can approximate many aspects of leather at a fraction of the cost. In other words, depending on the quality you’re looking for, there’s a huge range to consider. If you love the aesthetic and feel of leather but you don’t love the price of top-quality leather goods, then the next best thing is blotter. Although technically made from plastic, this faux leather offers a more than passable immigration of the soft and supple feel of leather. If you’re looking to double your desk pad as a mousepad, you’ll also appreciate that the blotter texture makes it suitable for both optical and laser mice. Some evenly dark or reflective surfaces can cause issues with your mouse, but that isn’t an issue here at all. 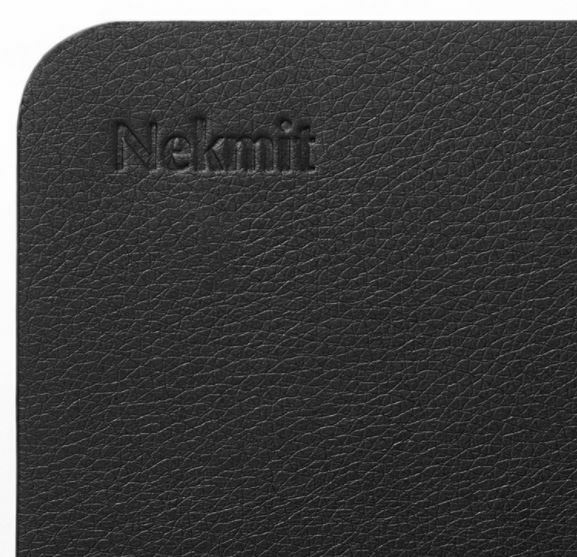 With Nekmit’s variable size options, you’ll have no problem finding a pad that’s large enough to place everything you might want to stick on it, including your keyboard, mouse, journal, or other documents. The backside uses another faux-leather for non-slip backing, which is effective at preventing slip on just about any furniture. This faux-leather pad is approximately 5mm thick, which is precisely enough to keep your desk well protected from scratches, stains, and ink. The standard 34″ x 17″ cut weighs 1.8 lbs., which is reflection of the quality of the imitation leather. You can also find size options including 17″ x 12″, a slightly broader 24″ x 14″, the standard 34″ x 17″, and the extra-large 36″ x 20″. Rather than just thinking about the size of your desk, people considering this pad should ask themselves how many things they want to pile on their pad. If you plan on using it for PC peripherals, you may need more space than you would for a pad that’s not involved with your computer. If you’re looking for authentic leather, Dacasso provides with their elegant and smooth chocolate brown desk pad. It uses top-grain leather, which is the most commonly used type for high-end leather products, and the second highest quality leather after full-grain. With immense resistance to strain, Dacasso is built to last through an entire career. One thing leather fanatics should note is that top-grain leather tends to develop less natural patina over time. Patina is that weathered look that leather collects with time, what makes leather age so distinctly and beautifully. While top-grain still develops patina, it’s not nearly as distinctive. 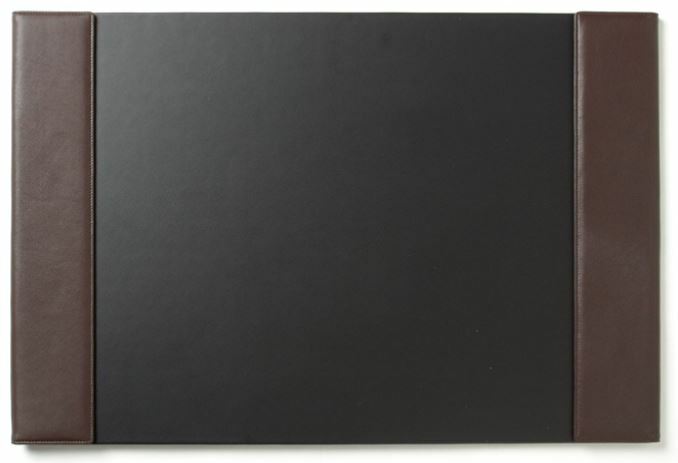 The pad itself is cut to 34″ x 20″, making it ideal for a standard sized desk. The outer edges of the pad are accented with side rails are 3-inches each, approximately the width of a business card. You can use those rails to tuck-in calendars, cards, and other documents. They’ll provide a firm hold, and are finely stitched in place to keep that firm hold over time. On the back of this pad you’ll find a non-slip felt that will secure the pad on just about any desk as long as it’s not made of waxed plastic. If you’re concerned about precisely matching the shade of brown, you’ll want to know that the particular color Dacasso uses is closer to a walnut brown than it is to an espresso brown. Finally, if you’re working out where things will be placed on this pad, you’ll want to keep in mind the actual workable area of the pad is 28 inches instead of the advertised 34. That six-inch difference is the result of both the 3-inch rails, which marginally alter the writeable space of the pad. Made from the world’s finest leather, full grain leather, Leatherology offers some of the best modern-looking desk pads that money can buy. Their pad has a polished finish that feels soft to the hand, and just as smooth to the eye. If you’re a leather connoisseur, you’ll be satisfied with the quality of the material as it keeps holding up through decades of graceful aging. Full grain leather comes from a hide that hasn’t been buffed, sanded, or otherwise altered to remove imperfections. 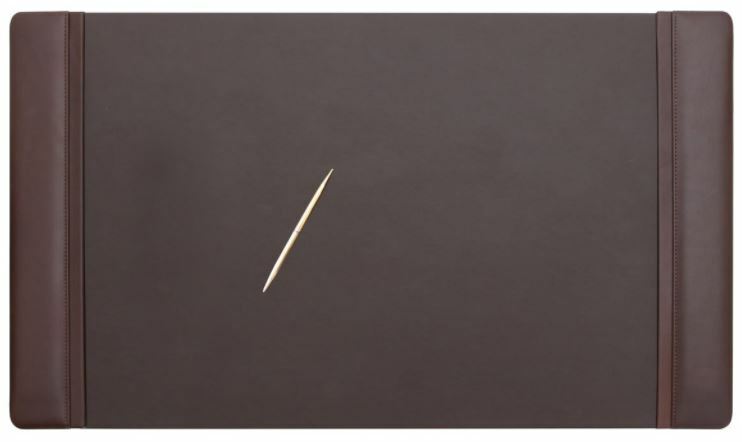 The remaining grain provides durability that’s unmatched, and isn’t contingent on the durability of sealant. The grain also retains considerable breathability, which leads to less moisture from extended contact with your hand. Coloring options mean you can a distinctive and modern-looking leather pad and still capture that sense of casual personalization. Many leather pads frankly look the same, so being able to choose between navy, cognac, or brown desk rails is a breath of fresh air that stands out in a market that’s packed with generic-looking desk pads. The side flaps on this pad flip open enabling the insertion of notes and so forth, which is beyond convenient. Full grain leather is typically reserved for the highest quality leather furniture and footwear. Used with a desk pad, you’ll find the pad gradually develop the full patina that gives aged leather its sense of personality and character. The standard 18″ x 26.5″ 0.5″ pad (height, width, depth) weighs a hefty 5.12 lbs., which helps demonstrate the quality of the leather. Finally, you’ll want to note that the texture of the hide you’ll end up with ranges from light-grain to lightly-pebbled. It depends entirely on the portion of hide that ends up getting used in your pad. 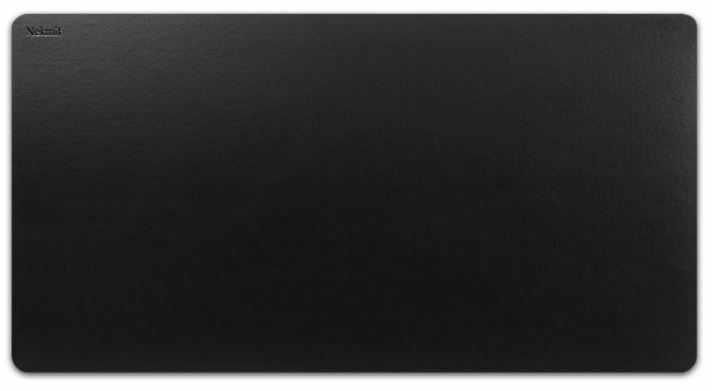 In deciding on the leather desk pad best for you, the majority of your consideration comes down to the quality of the product you’re looking for. If you don’t have a special affinity for the quality of leather, you’ll be satisfied with Nekmit’s “leather” blotter. In terms of faux leather, it’s extremely passable. It’s elegant and fundamentally as effective as the other desk pads here. Plus, it’s especially valuable for placing optical mice that may have issues on uniformly-dark surfaces like some pads. If you want high quality built with a distinctive brown aesthetic which would be at home in any law office, you’ll be satisfied with Dacasso’s top-grain leather pad. It has side railing, felt backing, and looks as high-end as it feels. The only sticking point with Dacasso is the lack of sizing options. The standard 34″ x 20″ sizing will work with most desks, but people with desks that are larger or smaller than average will probably want to look elsewhere. 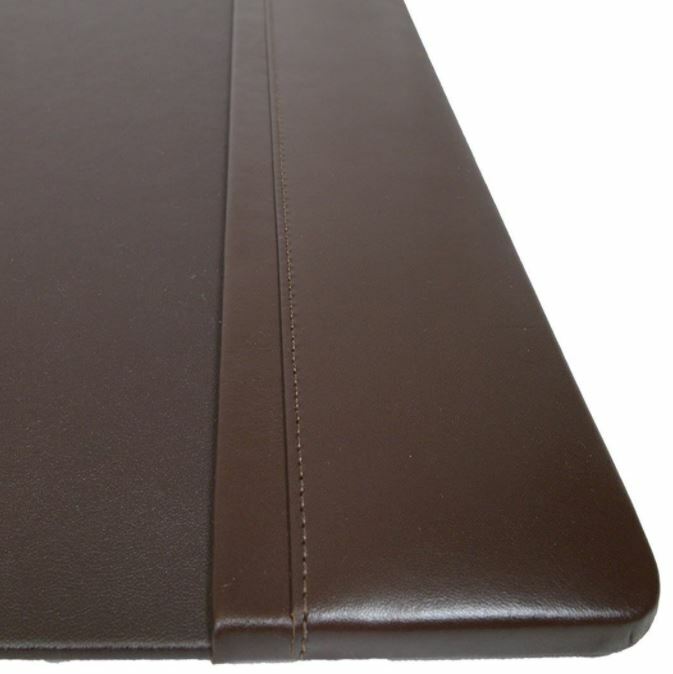 And finally if you’re looking for quality above all else, then you want Leatherology’s desk pad. Using full grain leather, you won’t find higher quality products on the market. After years of ownership, it will develop the full patina distinctive of the highest quality leather. And with lifetable leather rails, this pad is where elegance converges with convenience and graceful aging. so, which company makes that pad in the top picture with the white stitching?